BUDAPEST (Reuters) — Thousands marched through Budapest's city centre on Saturday to protest against a new law that allows employers to ask staff to work up to 400 hours per year of overtime. Saturday's rally, organized by opposition parties, trade unions and civic groups, mainly targeted the new labour law dubbed by critics as "slave law." 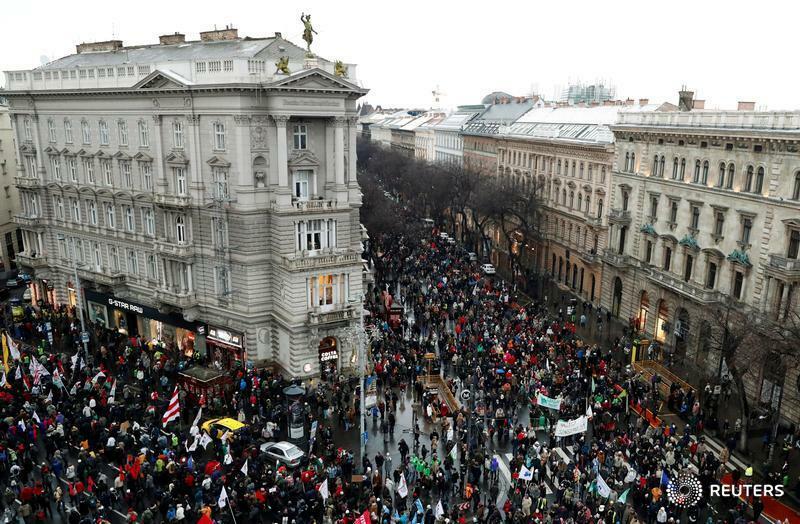 The protesters marched in snowfall from the historic Heroes Square to the parliament building on the bank of the Danube river, carrying banners such as "Sweep away the regime." "We disagree with almost everything that is going on since this government got into power (in 2010), from corruption to pseudo-democracy," said 50-year old housewife Eva Demeter. She said more Hungarians were pouring onto the streets because the slave law "affects a bigger crowd." Some of the protesters posted on social media or carried banners calling for a "national strike." Zoltan Mucsi, the head of steelmaker Dunaferr's Vasas trade union, said it was undemocratic that the government did not discuss the labour code changes with the unions. The past weeks' anti-government rallies were also against a law that sets up new courts which critics say could be politically manipulated, and against bias in state-controlled media.